This book is a favorite children's classic all about sharing and giving. I don't know if I could assign a specific age group for this books as I believe it would do well for any age group whether it's a kindergarten class or a college class. 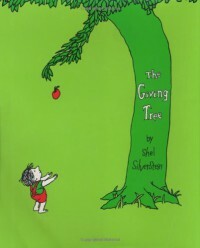 The Giving Tree is a good book to share and help bring positivity to a classroom. For this particular book, I would read it to the class asking the class for predictions on what they think will happen and why they think an event happened throughout the book. Once we've discussed the book, I would ask them to by a show of quiet thumbs ask them if someone has ever given them something, have they ever given or shared with someone else, and would they share with someone given the opportunity. After quiet thumbs, I would have them write or draw depending on the grade what they could do for someone in their lives.